You are currently browsing the category archive for the ‘hee’ category. Penguins should maybe not wear wigs. I’m still pretty sick, though I’ve finally kicked the fevers. I lost most of the week sleeping and sweating and cringing with pain every time I swallowed, so the holiday sort of snuck up on me. Anyway, Happy Independence Day! I’m totally burned out. Because I am a giant nerd and was a complete waste of space at work, I decided to seek validation via Google and learned that burn out has actual symptoms. Most are vague enough that pretty much anyone who is slightly bored or unhappy could probably see themselves in them but I did find an alarming comparison chart to help you determine if you are stressed out or burned out (I feel like these prolly get fewer hits than all those “Do you have a cold or the flu?” sites). I know these can be very serious issues for people, but this page is SO ridiculously dramatic, indicating that while stress may kill you, burnout might just make your life seem like it isn’t worth living. How is this helpful? They must be trying to giggle the burnout out of of the reader. If so, this bit should do the trick: “If excessive stress is like drowning in responsibilities, burnout is being all dried up. ” Ok drama queen. According to the weather robots, it is 96 degrees with the Heat Index today. Stupid August, all hot and sweltery. So, instead of going to the yard sale I planned on, I went to the air conditioned library. I got lots of goodies, including the audio-book of Phillip Pullman’s The Golden Compass on recommendation from Sunday. So far I’ve listened to about 20 minutes and I like it about 40 times more than the book. I guess I need someone to tell me fantasy stories instead of reading them because I enjoy fantasy movies (and evidently audio books) so much more than books. Reading them feels like too much work. Anyway, I’m getting back on the His Dark Materials wagon in preparation for the upcoming movie version (hop on board, you know you want to!) and it starts with this. Please take a gander at my awesome daemon, Callum, and let me know if you think he should remain a lion by answering a few questions about me, your darling Keem. Check it out here. Currently Callum (read:Keem) is modest, responsible, a leader, inquisitive and sociable. But what do you think? Even though the next semester is looming large in only a few weeks, there are lots of things to be excited and happy about right now, not the least of which is that no less than three (count ’em three) members of my friend-family are starting exciting new career-furthering jobs in the next month. Hooray and congrats to all of them. The understated, sneakily moving, music-filled delight that is this movie. I want the soundtrack immediately. Running constantly, please. According to this, Sunny is coming to DVD! Hooray. Finally finally the food scientists have listened to my silent pleas. I need to get my hands on this as soon as possible. Good lord. Like I need more reasons to be afraid of bugs. Or deep sea creatures. Or butterflies, for pete’s sake. A little duck went swimming. Then the crab came. A lobster came. And a popsicle was playing by itself. 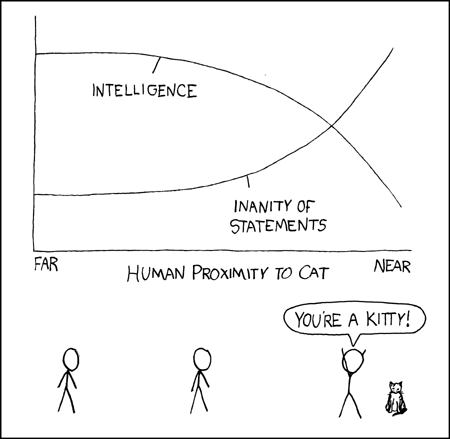 Once again from delightful xkcd. Man. That drawing of the cat is really almost too much to bear. I’ve been looking at it for 15 minutes and it still is making my giggle aloud.